New Jersey, get ready to rock harder than ever! The second annual ROCK CARNIVAL will take place on September 30, October 1 and October 2 in Lakewood, NJ at First Energy Park, home of the Lakewood Blue Claws. As with its inaugural year, which drew a staggering 50,000+ attendees, the second annual ROCK CARNIVAL will feature classic carnival rides and entertainment, the most delicious food truck offerings, high-action Professional Wrestling, beer gardens pouring the tastiest of brews, and of course... the best in local, national and international rock and heavy metal music performances! This year will introduce a "Classic Rewind" Friday Night concert, featuring some special performances from 2015 performers, returning to the event they loved. Three-day general admission and reserved seat WEEKEND PACKAGES for this year's ROCK CARNIVAL go on sale Friday, May 13 at 12:00pm Eastern time. Three-day "Early Bird" general admission passes start at $95.90 and weekend reserved seat tickets start at $119.99. Get your tickets HERE via TicketFly. The first wave of ROCK CARNIVAL live music entertainment to be announced is topped by single-day headliners TWISTED SISTER, whose performance will mark their official farewell show for the U.S. northeast. With over 2 million records sold, TWISTED SISTER is undoubtedly one of the biggest heavy metal bands to emerge from the tri-state area, hitting the big time in 1984 with their hit tracks "We're Not Gonna Take It" and "I Wanna Rock". Since then, TWISTED SISTER have never wavered as pop culture icons - from their never-ending MTV/VH1 music video rotation and coverage that remains to this day, to standing up for the rights of musicians everywhere during their highly-publicized battle with the PMRC in 1995, to their resurgence over the last two decades with countless performances and iconic frontman Dee Snider's A&E Network TV show Growing Up Twisted. The band closes its career close to where it all began in Lakehurst, NJ where they played many shows early on in their career. This performance at ROCK CARNIVAL will mark the end of an era for heavy metal and TWISTED SISTER - tri-state area fans, don't miss your chance to see the band at their final area performance! 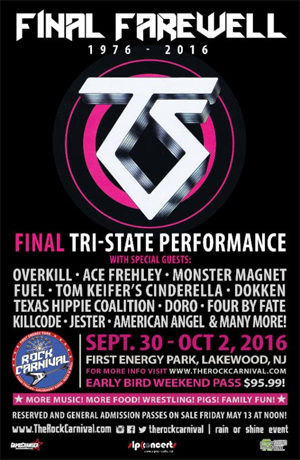 TWISTED SISTER's JJ French states, "As 2016 marks the end of our live performing career, TWISTED SISTER is looking forward to returning to the Tri-State NYC area for the final time to the ROCK CARNIVAL at First Energy Park in Lakewood, NJ on Oct 1, 2016. In celebrating our 40th anniversary and our farewell to live performing, we are bringing our "40 & F*ck It" worldwide farewell tour one last time to the area that created us!" Other top hard rock and metal artists already confirmed to perform at ROCK CARNIVAL include OVERKILL, ACE FREHLEY, MONSTER MAGNET, FUEL, TOM KEIFER'S CINDERELLA, DOKKEN, TEXAS HIPPIE COALITION, DORO, FOUR BY FATE, KILLCODE, JESTER and AMERICAN ANGEL. Several more ROCK CARNIVAL performances will be announced soon, taking place on multiple stages including two main festival stages, side by side, on the field. Fans will have general admission access to the stadium field. The event will feature the Birch Hill stage, a very popular performance area and craft beer section. ROCK CARNIVAL producer John D'Esposito says, "This year's line-up far exceeds our expectations." He adds, "The incredible new layout, amenities and resources are sure to enhance the Carnival experience for our fans and their families." More carnival details, per-day line-ups and other entertainment will be announced soon. For more information, visit http://therockcarnival.com/.